Hindringham Upper or Summer Green towermill stood in the middle of the village on the south side of the Wells Road next to the Chequers pub and was owned by the pub landlord on at least one occasion. 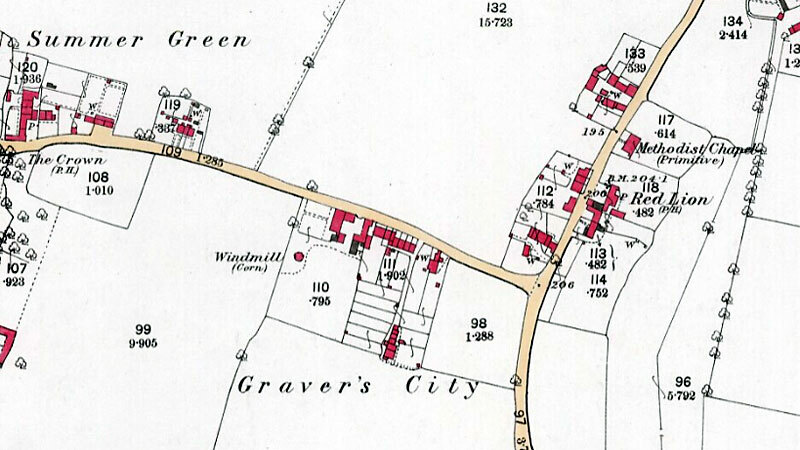 The mill site was also known as Graver's City, as in 1839 the landlord and miller was Thomas Graver. In later years it became known as Lake's mill. The mill had two pairs of double shuttered patent sails, each with 7 bays of 3 shutters that drove 2 pairs of French burr stones. The Norfolk boat shaped cap had a 6 bladed fan, gallery and petticoat. In 1834 the mill was 3 storeys high but by 1856 a further storey had been added. A bake office and general shop were also run on the premises. Thomas Daplyn mortgaged the mill, the mill house, bakery, shop and stables to the bank of Messrs. Gurney & Birkbeck for £800. However, he defaulted on the repayments and the bank repossessed the mill complex in 1839 before selling it to Thomas Daplyn's cousin (b.1797) who was a shopkeeper and farmer and also happened to be called Thomas Daplyn and it was he who was shown as miller in the 1841 census. Mark Daplyn ran the Chequers pub 1854-1856. Robert Daplyn ran the Dukes Head pub on the Binham Road 1841-1869 and was aged 33 in 1851. Mr. John Reeve will offer for Sale by Auction at the Black Lion Inn, Little Walsingham, on 8 April next. 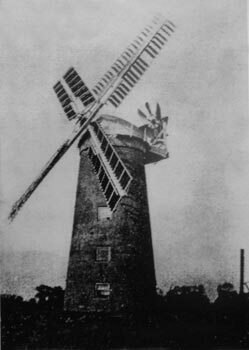 A very superior Brick built Tower Windmill with patent sails, containing three floors, and driving two pair of French stones. Also a suitable dwelling house near. Also a Baking Office and Shop adjoining the house. The premises are situate at Hindringham, in Norfolk, are brick built and tiled, and were erected by the Proprietor in a very substantial manner and on an excellent plan in 1829. Immediate Possession may be had. For particulars and leave to view the Property apply to Mr. Kent, Fakenham. Mr. John Reeve will offer for Sale by Auction At the Black Lion Inn, Little Walsingham on Tuesday 8 April next at 4 o’c. 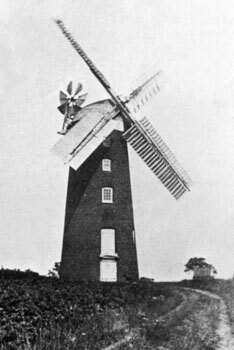 A Very Superior BRICK BUILT TOWER WINDMILL with patent sails, containing three floors & driving two pairs of French Stones; also a suitable Dwelling house near comprising … Also a Baking Office & Shop adjoining the house. Also a Cow house, cart house, piggery & other buildings, there is also a well planted garden & small inclosure of land adjoining, which with the yards & sites of the buildings containing about an acre. The Premises are situate at Hindringham in Norfolk, are brick built & tiled & were erected by the Proprietor in a very substantial manner on an excellent plan in 1829. The situation is a very advantageous one for Trade & Immediate Possession may be had. To view the Property apply to Mr. Kent, Fakenham or to the Auctioneer. Letters to be post paid. 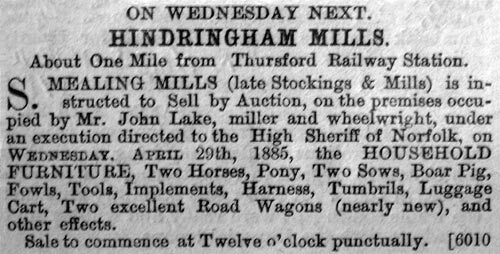 Owners: Gurneys, Birkbeck & Co.
To be sold by Auction by William Kendle & Son at Red Lion, Fakenham Thursday 4 December 1856 at 4 o’c. A Powerful & substantial BRICK TOWER WINDMILL, with four floors, four new patent sails, drives two pairs of French stones (new), wheat chamber for six lasts & all the going gears, with barn, stables, cart lodge, piggery & other convenient outbuildings. A convenient Grocer’s & Draper’s Shop & a newly erected Bake Office with granary over the same. 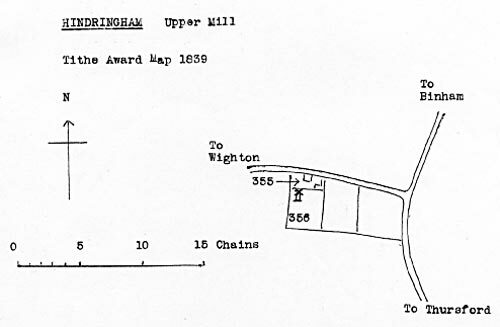 Garden & Pightle of land containing with the site of the mill & buildings 1a. 1r. 11p. Apply to Mr. Waters, Solr. Walsingham, Kent & Watson, Solrs. Fakenham, or Auctioneers. A First Class TOWER WINDMILL in populous district, a good house, Garden, Van & Cart lodge, gig houses, Cattle Yard & Pightle of excellent Land. Apply to Richard Elgar, Gateley. A FIRST RATE TOWER WINDMILL in a populous district, a good house, garden, granary, stable for 4 horses, van & cart lodge, piggeries & cattle shed, yard, a pightle of excellent land; also a bakehouse & general shop attached. Possession at Michaelmas next. The above trade all carried on by the present tenant. Part of the purchase money can remain on mortgage if required. Apply to Richard Elgar, Gateley, East Dereham. A Good TOWER WINDMILL, capital House, General Shop & Bake Office, Granaries etc. etc. Pightle of excellent land. The above is Copyhold but Fine Certain £7. 10s. Now in occupation of Mr. William Sands who has notice to leave at Michaelmas next. Price £685. Apply to R. Elgar, Gateley. BRICK TOWER WINDMILL in good repair. Apply to Messrs. IRELAND, Guestwick or 15 Bank Plain, Norwich. About 4 miles from Walsingham G. E. R. Station & 1½ miles from Thursford M. & g. n. station. Lot 1. Capital Dwelling House & Baking Office, cottage & garden ground, stables, sheds etc. Also Pightle of Land & excellent Tower Wind-Mill in good order, containing altogether 1a. 0r. 0p. (more or less) occupied by Mr. Robert Whall at low yearly rent of £28. One of Mr. Shackcloth’s engines of Gt. Snoring nr. Fakenham pulled down a disused mill at Hindringham. I took these two photographs over 60 years ago. My uncle, Robert Wall, was the miller at the Upper Mill when the photograph was taken about 1903; and my grandfather, Robert Wall, was at the Lower_Mill in 1845, over 120 years ago. As a boy I climbed down the inside chain of the Upper Mill from the top of the mill to the bottom and an employee climbed down the outside rope from the fly-wheel to the ground; but I dare not tackle that. On this site stands a house with part of it shaped like a 2 storey tower mill stump, with a low conical roof. I assume this is a "faux" windmill stump, rather like the one that incorporates the remaining fragment at Feltwell. White's 1854: Mark Daplyn, Chequers Inn p.h. White's 1854: Robert Daplyn, Duke's Head p.h. c.1938: Mill pulled down by traction engine belonging to Shackcloth Bros.